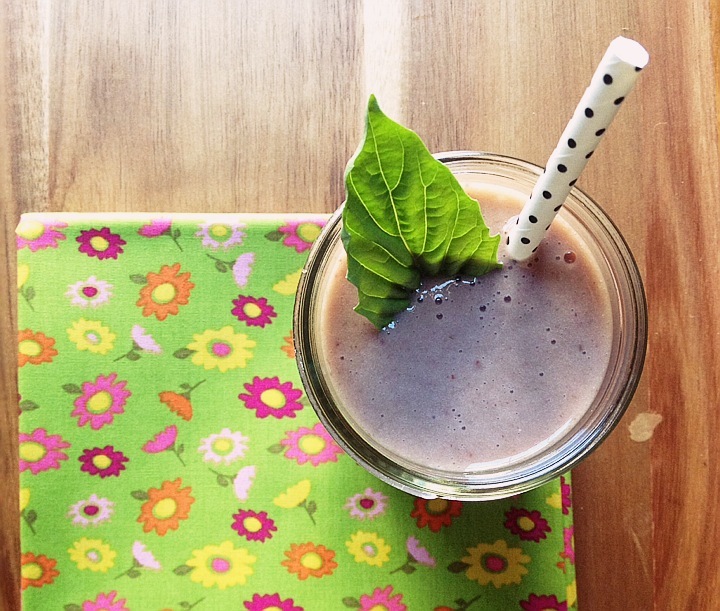 Now that summer is here, we can officially celebrate smoothie season! Earlier this year I received a Nutri-Bullet for my birthday, so I have been having a lot of fun experimenting with different drink and smoothie recipes. I love the idea of adding herbs to my smoothies for an extra dose of health-promoting phytonutrients. In this recipe, basil is the perfect and unexpected herb that complements the strawberry and banana smoothie perfectly! Besides tasting great, basil has wonderful anti-inflammatory and anti-bacterial properties, and is also rich in vitamin A, vitamin K, and Iron. Traditionally, basil has been used to help treat headaches, digestive issues, and poor circulation. Now you can try basil in something other than your savory dishes, pesto sauce, and salads! When making smoothies, I generally prefer to use frozen fruit instead of ice – but for this smoothie or any other smoothie recipe you can add a few ice cubes if your fruit isn’t frozen.